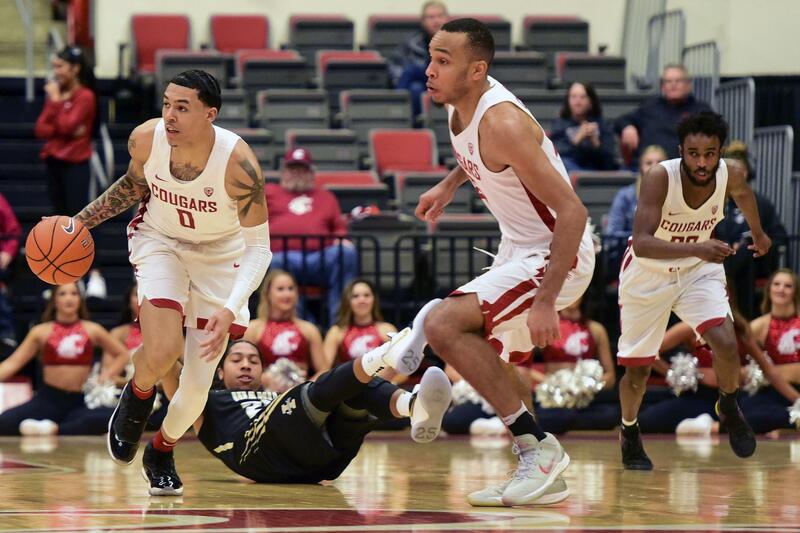 PULLMAN – Jeff Pollard announced Tuesday he’d return to Washington State for his senior season after briefly looking at transfer options, but now two of his teammates are undecided on their careers with the Cougars. Point guard Ahmed Ali and forward Isaiah Wade, former junior college players who signed with WSU last offseason, have entered their named into the NCAA’s transfer portal, according to VerbalCommits.com and Cougfan.com. SOURCE: Not only has Ahmed Ali entered the transfer portal, but Isaiah Wade has done so as well. Ali and Wade were recruited by, and played one season under former coach Ernie Kent, who was fired less than 24 hours after WSU’s 33-point loss to Oregon in the Pac-12 Tournament, capping a season that saw the Cougars go 11-21 and 4-14 in conference play. New WSU coach Kyle Smith mentioned Wade by name in his introductory press conference and both Wade and Ali were among the eight players – nicknamed the “Almighty Eight” – Smith said would be the foundational pieces of his program in Pullman. Wade and Ali also participated in Smith’s first few practices at WSU, along with Pollard, CJ Elleby, Jaz Kunc, Jervae Robinson, Marvin Cannon and Chance Moore. Both players have only one year of eligibility remaining. A Toronto native who came to WSU from Eastern Florida State College, Ali started in 24 of the 32 games he played in for the Cougars, scoring 7.3 points per game and dishing out 2.9 assists with a 2.4 assist/turnover ratio. Ali scored a season-high 18 points and had seven assists with no turnovers, playing a season-high 35 minutes in WSU’s home loss to USC. Wade, an athletic power forward who transferred from Iowa Western Community College, played 29 of a possible 32 games for the Cougars – missing three due to injury – and averaged 4.6 points with 1.4 rebounds. Wade made two starts for Kent’s team and had a double-double with 17 points and 10 rebounds in a loss to Seattle U. Of the scholarship players on WSU’s 2018-19 roster, only sharpshooting guard Carter Skaggs has said for certain he’d be leaving the program. Skaggs, whose minutes and production both diminished last season, announced on March 20 he’d be pursuing other opportunities as a graduate transfer. The Cougars had three players signed to the 2019 class, but only one of them – point guard Ryan Murphy – has confirmed he’d still be joining the team this fall. Forward Nigel John has reopened his commitment, though WSU remains his No. 1 option, and another forward, Daron Henson, hasn’t given indication one way or the other.